On The Road Again Article: Some people are born into royalty, riches, or fame. 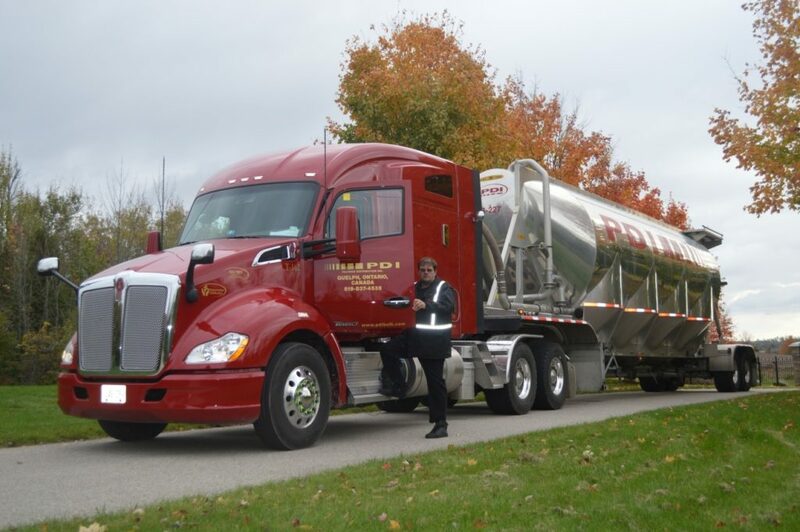 Harold Bezemer was born into a truck driving family and was destined to be a truck driver. His family owned Bezco Trucking and it stayed in the family until 2016 when it was sold after his uncle retired. The way Harold tells it, the job chose him. Harold Bezemer is considered by some a giant of a man, probably because he stands about 6’5” and because he is a well-liked and respected driver. Harold was hired at PDI in 2001. He was interviewed by VP Sales Bruce Bottomley. Did his road test with senior driver Ross Brigden and trained with another senior driver Bob Schofield. 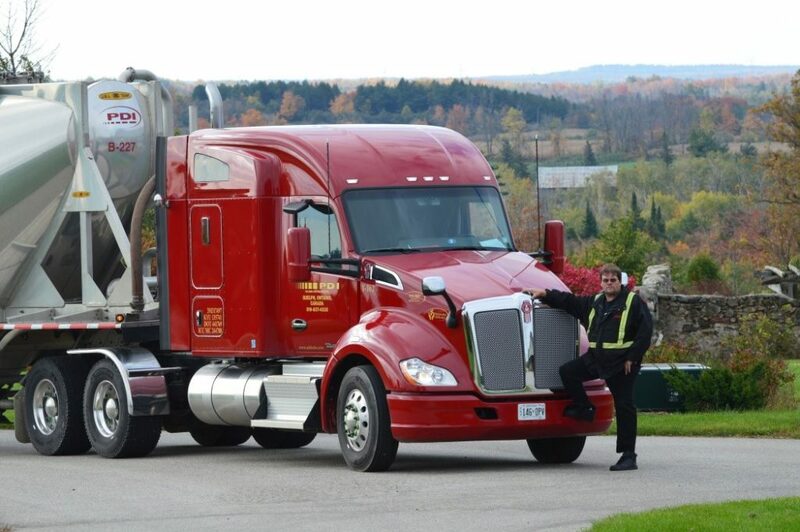 Harold has been hauling dry bulk polymer resins based out of the Streetsville terminal since the day he started here. Truck drivers can be a funny lot, some want to only haul local short hauls and some insist on nothing but long hauls. Some only want to drive only during the day and some want to drive the roads at night or start their day at 3am and 4am. They are all unique and have their own endearing quirks, but Harold takes it all in stride. He will haul any load with any product. There isn’t a trailer (tandems, tri’s, quads, 5 axle, container and chassis) or dry bulk resin at PDI that he hasn’t hauled at one time or another. Harold has his TDG training for liquid loads, but he does not haul chemicals. He has been sent to Quebec, Alberta and British Columbia for weeks on end to cover for drivers on vacation, illness or driver shortages. But most of his work at PDI is on the Ontario long hauls, usually covering US loads. Crossing the border for US loads requires an ACE manifest, which includes the BoL with PARS sticker. Harold has a FAST card, but says that PDI is not a FAST approved carrier, so it doesn’t make a difference to him. Carrier, driver and shipper all have to be FAST approved to use the FAST lanes at the borders. When I asked Harold how long he had been a truck driver, he said he had been driving professionally since December 13th 1988; he knew the exact date! He failed his first AZ road test because he felt the tester didn’t want to pass an 18 year old. It was his second attempt and he never forgot the date. Harold Bezemer with T162 and B227. Driving for the long haul. So what led him to work at PDI? Well he started as a container crane operator at sixteen years old for Melburn Truck Lines. Got his AZ license at eighteen (we know the exact date) and started driving locally for Bezco on flatbed for four years. He started US loads when he turned twenty-one. Drivers have to be twenty-one to get a CDL, the US equivalent to an AZ, so you have to be that age to drive commercially in the US. At twenty-five years old Harold joined Trimac (Trimac didn’t hire drivers younger than twenty-five) hauling fuel. He made the change because he was offered a local position and more money. At some point he got out of his truck and married Michelle in 1996. Their son Bradley was born in 1997 and another son Curtis in 2000. 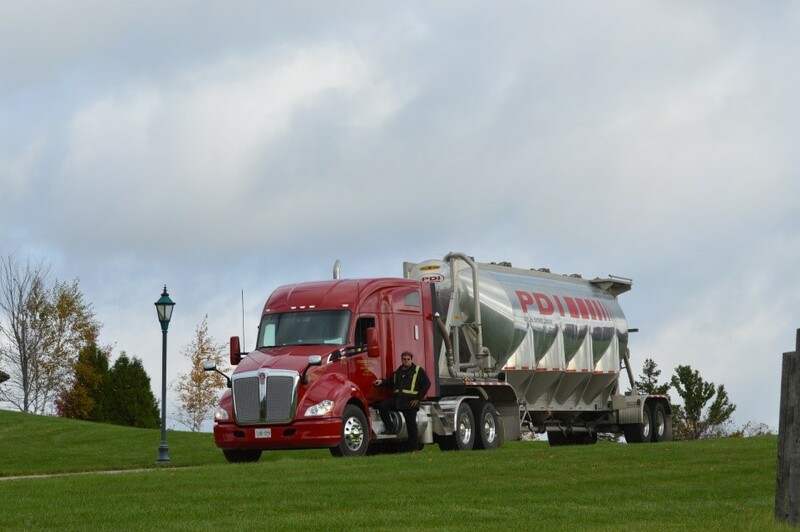 Trimac worked as a contracted carrier at Petro Canada and had two trucks on with six drivers hauling fuel. Trimac closed the Oakville terminal Harold was working at and Petro Canada hired the six Trimac fuel drivers. He was at Petro Canada hauling fuel for four years. They went on lock-out strike and Harold came to PDI, fell in love with the place and never went back. 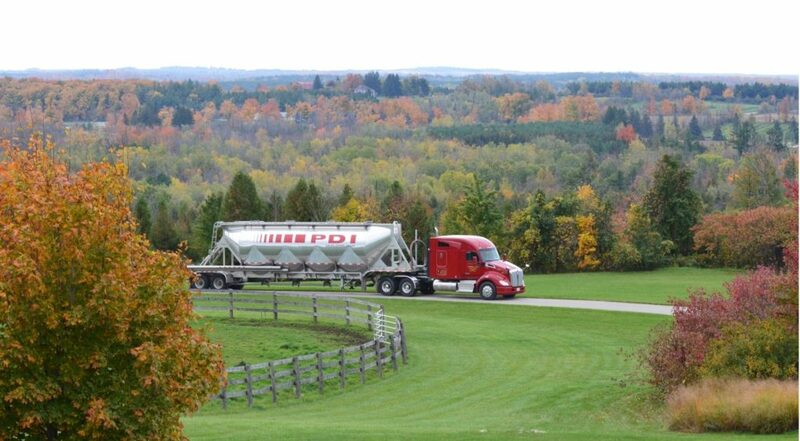 Harold did a lot of tanker training with Petro Canada and Trimac. In 2006, he became a driver trainer at PDI. Courses he has taken at PDI include: Hours of Service, Defensive Driving, Close Quarters Training, Coaches Training Courses, Train-the-trainer, Safe Handling Procedures, Safety videos and webinars. Harold takes a lot of pride in the drivers he has helped at PDI and advises that we have to take our time to train new drivers; never send a driver out on the road just because we are busy. He encourages ongoing training for all drivers. Harold also trains drivers in Self Loading dry bulk resin from railcars to tankers. Drivers use their pressure gauges to judge the weight. Most of the time you try to load from the back first, where the axles are, and top up the finished weight on the front. Knowing when to change from back to front is controlled by the pressure gauges, but there are so many different variances. Any good driver can hook the hose up and get the product flowing, but balancing the weight is tricky and takes experience. You cannot learn this from reading a manual. You have to do the work to understand it. Safety is the jobs number one priority. Harold feels drivers and yard loaders can never practice enough safety measures. Safety is the number one priority. You cannot open up a pressurized vessel. 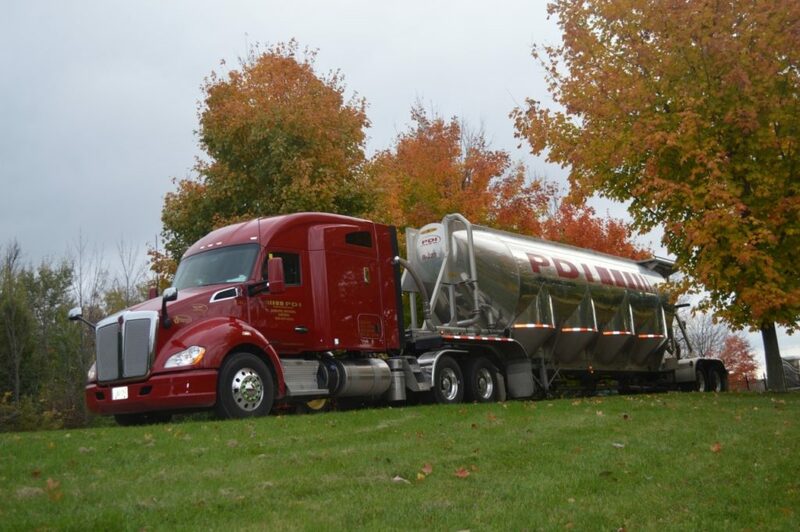 When you pick up a trailer, you do not know if that tanker has pressure in it. You must check your gauges to make sure they are at zero and the blow down should be open before any caps are removed. Just in case though, you should always stand off to the side when removing a cap or opening a hatch. Make it a habit to always stand off to the side. It is a good habit to get into. That way, if you forget a step you are always out of harm’s way. Doing a pre-trip is a very important step in a driver’s day. A proper circle check is essential. Harold advises drivers he is training to always follow MTO guidelines and the PDI guidelines stated in the Driver Manual. When Harold arrives at a customer’s yard and is ready to get out of his truck, the first thing he does is apply the parking brake. He says it is another good habit to get into and he is surprised at the number of drivers who don’t automatically apply the parking brake. Harold thinks the best attribute of a skillful commercial driver is patience. You combine a patient driver with the proper training, including safe driving tools and you have a competent combination. A well informed driver also understands the products he is hauling and is aware of safe handling procedures. Respect for the law is another notable attribute. Harold is a good, reliable example for the drivers he is training. He believes in PDI’s Safe Driver Awards and with zero accidents he has been a recipient himself for many years. PDI has a Quality CPAR (Corrective Preventative Action Report) program run by our Quality Manager Cathie Collins. Harold works with Cathie to help drivers who have driving issues to correct the problems through hands on training and auditing. Besides being a driver trainer at PDI. Ontario Drivers voted Harold as the Ontario Driver Representative. He has held this position for the past four years. The truck you are driving has a lot to do with how good a driver you are. Harold says it is like a marriage…a good driver needs a good truck to create a well-balanced partnership. Until recently Harold drove a 2009 Kenworth. Harold put over 1.3 million kms on T104. The truck had a great Cummins ISX engine. This month PDI moved Harold into T162 a 2017 Kenworth bunk truck with a Paccar M13 engine. The new truck has super singles, unlike T104 which had duals. Harold will lose his New York Heavy Weight Permit because New York does not allow super singles. The best thing about Harold’s career choice is the chance to travel and working with wonderful people. He doesn’t have a least favorite customer, but notes ABC Automotive in London, Kentucky among his favorites, for the nice long run and good people to work with. The worst thing about his career choice is the same as most long haul drivers: he would like to be home more. There aren’t normal start hours to his day and he works 14 to 16 hour days. Drivers in Ontario can work up to 70 hours then you have to take a 36 hour rest. Which means the shift is basically Monday to Sunday; whenever his dispatcher Shana Burgess needs him and his Hours of Service allow. Like most Canadian kids, Harold grew up playing hockey. He was a goalie. Jokingly says he waited for the Toronto Maple Leafs to call, but they never did! So, when he wasn’t driving, he spent ten years as a Goalie Coach and Hockey Trainer on his son’s hockey team. His boys are growing up, life is good, and these days he looks forward to being a part of PDI’s future growth and prosperity. Maybe the Leafs didn’t want Harold, but he is sure a star here at PDI!